NOTICE TO NOTARIES PUBLIC: Upcoming changes to the law will affect you! The Office of the Idaho Secretary of State issued a previous memo (May 2018) based on our understanding of the intent of the legislature. In that memo, we stated notaries could continue to use their current stamp until their commission expired. 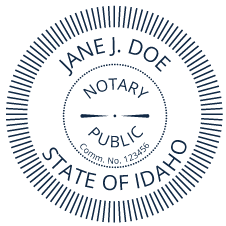 However, upon further review and input from the Attorney General, it has been determined that — as required by law — ALL notaries must use a stamp conforming to the new standard effective October 1, 2018. This is regardless of a notary’s current status or commission expiration date. It is recommended that all notaries public purchase a new stamping device well before October 1, 2018.